Ever go into a burger restaurant, only to realize that it sells some of the most kickass tacos? That's what watching Inou-Battle wa Nichijou-kei no Naka de feels like. Came in expecting superpower battles, came out having experienced one of the best anime dealing with friendship. HOW COOL IS THAT? Right off the bat, this anime tells a story of a group of normal high schoolers (and one primary schooler) gaining superpowers. For some inexplicable reason, they are now held with the burden of functioning as normal students with these destructive weapons at their disposal. Not surprisingly, this presents quite a problem for them; and I think that's the purpose these superpowers serve. They were implemented as a device to see how the main male character, Andou, would resist his chuunibyou desires to use his cool-yet-dangerous powers. They were implemented to see how Sayumi, the most level-headed member of the group, would manage this newfound burden as the leader (and so on and so forth). At the end of the day, we didn't get many battles; rather, we received a story of a series of struggles that these high schoolers faced while possessing these powers. Meanwhile Tomoyo, though still an easily riled tsundere, somewhat has her own justifications for being one, as well as some motivations in her life that (gasp!) don't involve Ando. And to the best of my memory, she never said to him anything like "I-it's not like I l-like you or anything..." And Hatoko, though still playing another archetype, eventually manages to break out of her shy bystander shell and try to reach out to her would-be lover. Along the way, though, she manages to command the spotlight in a five-minute (!) speech seriously questioning Ando's "chuuni" philosophy which also somewhat rattled some of us fans and our at-times similar worldviews. 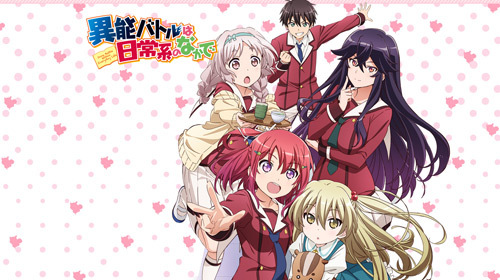 With Inou-Battle, don't look forward to supernatural battles. Instead, look forward to deep themes of hard work, responsibility, self-honesty, and friendship. Inou-Battle will deliver. So, that’s it. I hope there will be a season 2.